NB-04 NB-02 Continous Band Sealer. Automatic Pouch Packing Machine with unique Tablet/ Capsule Counting System, Suitable to pack Tablet/ Capsule in Laminated pouches. 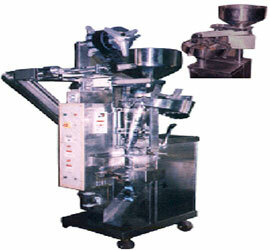 It is very widely use in Pharmaceutical Industries, specially in Generic Division. •1 Tablet to 100 Tablets can be packed in each pouch with counting system. •Digital Temperature controller for accurate sealing. •Digital Photo control system, automatically adjust & correct eye mark within ± 1.5mm. Compact design with castor wheel for easy mobility. Very easy to Clean & Set for product change over.